This product contains the following inactive ingredients: disodium edetate, sodium hydroxide, purified water, and hydrochloric acid, if necessary. The viscosity of pulmonary mucous secretions depends on the concentrations of mucoprotein and, to a lesser extent, deoxyribonucleic acid (DNA). The latter increases with increasing purulence owing to the presence of cellular debris. The mucolytic action of acetylcysteine is related to the sulfhydryl group in the molecule. This group probably â€œopensâ€ disulfide linkages in mucus thereby lowering the viscosity. The mucolytic activity of acetylcysteine is unaltered by the presence of DNA, and increases with increasing pH. Significant mucolysis occurs between pH 7 and 9. Acetylcysteine undergoes rapid deacetylation in vivo to yield cysteine or oxidation to yield diacetylcystine. Occasionally, patients exposed to the inhalation of an acetylcysteine aerosol respond with the development of increased airways obstruction of varying and unpredictable severity. Those patients who are reactors cannot be identified a priori from a random patient population. Even when patients are known to have reacted previously to the inhalation of an acetylcysteine aerosol, they may not react during a subsequent treatment. The converse is also true; patients who have had inhalation treatments of acetylcysteine without incident may still react to subsequent inhalation with increased airways obstruction. Most patients with bronchospasm are quickly relieved by the use of a bronchodilator given by nebulization. If bronchospasm progresses, the medication should be discontinued immediately. Acetylcysteine is contraindicated in those patients who are sensitive to it. After proper administration of acetylcysteine, an increased volume of liquified bronchial secretions may occur. When cough is inadequate, the airway must be maintained open by mechanical suction if necessary. When there is a mechanical block due to foreign body or local accumulation, the airway should be cleared by endotracheal aspiration, with or without bronchoscopy. Asthmatics under treatment with acetylcysteine should be watched carefully. Most patients with bronchospasm are quickly relieved by the use of a bronchodilator given by nebulization. If bronchospasm progresses, the medication should be discontinued immediately. With the administration of acetylcysteine, the patient may observe initially a slight disagreeable odor that is soon not noticeable. With a face mask there may be stickiness on the face after nebulization. This is easily removed by washing with water. Under certain conditions, a color change may occur in acetylcysteine in the opened bottle. The light purple color is the result of a chemical reaction which does not significantly affect the safety or mucolytic effectiveness of acetylcysteine. Continued nebulization of acetylcysteine solution with a dry gas will result in an increased concentration of the drug in the nebulizer because of evaporation of the solvent. Extreme concentration may impede nebulization and efficient delivery of the drug. Dilution of the nebulizing solution with appropriate amounts of Sterile Water for Injection, USP, as concentration occurs, will obviate this problem. Drug stability and safety of acetylcysteine when mixed with other drugs in a nebulizer have not been established. Carcinogenicity studies in laboratory animals have not been performed with acetylcysteine alone, nor with acetylcysteine in combination with isoproterenol. Long-term oral studies of acetylcysteine alone in rats (12 months of treatment followed by 6 months of observation) at doses up to 1,000 mg/kg/day (5.2 times the human mucolytic dose) provided no evidence of oncogenic activity. Published data1 indicate that acetylcysteine is not mutagenic in the Ames test, both with and without metabolic activation. A reproductive toxicity test to assess potential impairment of fertility was performed with acetylcysteine (10%) combined with isoproterenol (0.05%) and administered as an aerosol into a chamber of 12.43 cubic meters. The combination was administered for 25, 30, or 35 minutes twice a day for 68 days before mating, to 200 male and 150 female rats; no adverse effects were noted in dams or pups. Females after mating were continued on treatment for the next 42 days. Reproductive toxicity studies of acetylcysteine in the rat given oral doses of acetylcysteine up to 1,000 mg/kg (5.2 times the human mucolytic dose) have also been reported in the literature.1 The only adverse effect observed was a slight non-dose-related reduction in fertility at dose levels of 500 or 1,000 mg/kg/day (2.6 or 5.2 times the human mucolytic dose) in the Segment I study. In a teratology study of acetylcysteine in the rabbit, oral doses of 500 mg/kg/day (2.6 times the human mucolytic dose) were administered to pregnant does by intubation on days 6 through 16 of gestation. Acetylcysteine was found to be nonteratogenic under the conditions of the study. In the rabbit, two groups (one of 14 and one of 16 pregnant females) were exposed to an aerosol of 10% acetylcysteine and 0.05% isoproterenol hydrochloride for 30 and 35 minutes twice a day from the 6th through the 18th day of pregnancy. No teratogenic effects were observed among the offspring. Teratology and a perinatal or postnatal toxicity study in rats were performed with a combination of acetylcysteine and isoproterenol administered by the inhalation route. In the rat, two groups of 25 pregnant females each were exposed to the aerosol for 30 and 35 minutes, respectively, twice a day from the 6th through the 15th day of gestation. No teratogenic effects were observed among the offspring. In the pregnant rat (30 rats per group), twice-daily exposure to an aerosol of acetylcysteine and isoproterenol for 30 or 35 minutes from the 15th day of gestation through the 21st day postpartum was without adverse effect on dams or newborns. Reproduction studies of acetylcysteine with isoproterenol have been performed in rats and of acetylcysteine alone in rabbits at doses up to 2.6 times the human dose. These have revealed no evidence of impaired fertility or harm to the fetus due to acetylcysteine. There are, however, no adequate and well-controlled studies in pregnant women. Because animal reproduction studies may not always be predictive of human responses, this drug should be used during pregnancy only if clearly needed. It is not known whether this drug is excreted in human milk. Because many drugs are excreted in human milk, caution should be exercised when acetylcysteine is administered to a nursing woman. Adverse effects have included stomatitis, nausea, vomiting, fever, rhinorrhea, drowsiness, clamminess, chest tightness, and bronchoconstriction. Clinically overt acetylcysteine induced bronchospasm occurs infrequently and unpredictably even in patients with asthmatic bronchitis or bronchitis complicating bronchial asthma. Acquired sensitization to acetylcysteine has been reported rarely. Reports of sensitization in patients have not been confirmed by patch testing. Sensitization has been confirmed in several inhalation therapists who reported a history of dermal eruptions after frequent and extended exposure to acetylcysteine. Reports of irritation to the tracheal and bronchial tracts have been received and although hemoptysis has occurred in patients receiving acetylcysteine such findings are not uncommon in patients with bronchopulmonary disease and a causal relationship has not been established. Acetylcysteine is available in rubber stoppered glass vials containing 4, 10, or 30 mL. The 20% solution may be diluted to a lesser concentration with either Sodium Chloride Injection, Sodium Chloride Inhalation Solution, Sterile Water for Injection, or Sterile Water for Inhalation. The 10% solution may be used undiluted. Acetylcysteine does not contain an antimicrobial agent, and care must be taken to minimize contamination of the sterile solution. If only a portion of the solution in a vial is used for inhalation, store the remainder in a refrigerator and use within 96 hours. When nebulized into a face mask, mouth piece, or tracheostomy, 1 to 10 mL of the 20% solution or 2 to 20 mL of the 10% solution may be given every 2 to 6 hours; the recommended dose for most patients is 3 to 5 mL of the 20% solution or 6 to 10 mL of the 10% solution 3 to 4 times a day. In special circumstances it may be necessary to nebulize into a tent or Croupette, and this method of use must be individualized to take into account the available equipment and the patient's particular needs. This form of administration requires very large volumes of the solution, occasionally as much as 300 mL during a single treatment period. If a tent or Croupette must be used, the recommended dose is the volume of acetylcysteine (using 10% or 20%) that will maintain a very heavy mist in the tent or Croupette for the desired period. Administration for intermittent or continuous prolonged periods, including overnight, may be desirable. When used by direct instillation, 1 to 2 mL of a 10% to 20% solution may be given as often as every hour. When used for the routine nursing care of patients with tracheostomy, 1 to 2 mL of a 10% to 20% solution may be given every 1 to 4 hours by instillation into the tracheostomy. Acetylcysteine may be introduced directly into a particular segment of the bronchopulmonary tree by inserting (under local anesthesia and direct vision) a small plastic catheter into the trachea. Two to 5 mL of the 20% solution may then be instilled by means of a syringe connected to the catheter. Acetylcysteine may also be given through a percutaneous intratracheal catheter. One to 2 mL of the 20% or 2 to 4 mL of the 10% solution every 1 to 4 hours may then be given by a syringe attached to the catheter. For diagnostic bronchial studies, two or three administrations of 1 to 2 mL of the 20% solution or 2 to 4 mL of the 10% solution should be given by nebulization or by instillation intratracheally, prior to the procedure. Acetylcysteine may be administered using conventional nebulizers made of plastic or glass. Certain materials used in nebulization equipment react with acetylcysteine. The most reactive of these are certain metals (notably iron and copper) and rubber. Where materials may come into contact with acetylcysteine solution, parts made of the following acceptable materials should be used: glass, plastic, aluminum, anodized aluminum, chromed metal, tantalum, sterling silver, or stainless steel. Silver may become tarnished after exposure, but this is not harmful to the drug action or to the patient. Compressed tank gas (air) or an air compressor should be used to provide pressure for nebulizing the solution. Oxygen may also be used but should be used with the usual precautions in patients with severe respiratory disease and CO2 retention. Acetylcysteine is usually administered as fine nebulae and the nebulizer used should be capable of providing optimal quantities of a suitable range of particle sizes. Commercially available nebulizers will produce nebulae of acetylcysteine satisfactory for retention in the respiratory tract. Most of the nebulizers tested will supply a high proportion of the drug solution as particles of less than 10 microns in diameter. Mitchell2 has shown that particles less than 10 microns should be retained in the respiratory tract satisfactorily. Various intermittent positive pressure breathing devices nebulized acetylcysteine with a satisfactory efficiency including: No. 40 De Vilbiss (The De Vilbiss Co., Somerset, Pennsylvania), and the Bennett Twin-Jet Nebulizer (Puritan Bennett Corp., Oak at 13th., Kansas City, Missouri). The nebulized solution may be inhaled directly from the nebulizer. Nebulizers may also be attached to the plastic face masks or plastic mouthpieces. Suitable nebulizers may also be fitted for use with the various intermittent positive pressure breathing (IPPB) machines. The nebulizing equipment should be cleaned immediately after use because the residues may clog the smaller orifices or corrode metal parts. Hand bulbs are not recommended for routine use in nebulizing acetylcysteine because their output is generally too small. Also, some hand-operated nebulizers deliver particles that are larger than optimum for inhalation therapy. Acetylcysteine should not be placed directly into the chamber of a heated (hot pot) nebulizer. A heated nebulizer may be part of the nebulization assembly to provide a warm saturated atmosphere if the acetylcysteine aerosol is introduced by means of a separate unheated nebulizer. Usual precautions for administration of warm saturated nebulae should be observed. The nebulized solution may be breathed directly from the nebulizer. Nebulizers may also be attached to plastic face masks, plastic face tents, plastic mouth pieces, conventional plastic oxygen tents, or head tents. Suitable nebulizers may also be fitted for use with the various intermittent positive pressure breathing (IPPB) machines. The nebulizing equipment should be cleaned immediately after use, otherwise the residues may occlude the fine orifices or corrode metal parts. When three fourths of the initial volume of acetylcysteine solution have been nebulized, a quantity of Sterile Water for Injection, USP (approximately equal to the volume of solution remaining) should be added to the nebulizer. This obviates any concentration of the agent in the residual solvent remaining after prolonged nebulization. The physical and chemical compatibility of acetylcysteine solutions with certain other drugs that might be concomitantly administered by nebulization, direct instillation, or topical application has been studied. Acetylcysteine should not be mixed with certain antibiotics. For example, the antibiotics, tetracycline hydrochloride, oxytetracycline hydrochloride, and erythromycin lactobionate, were found to be incompatible when mixed in the same solution. These agents may be administered from separate solutions if administration of these agents is desirable. The supplying of these data should not be interpreted as a recommendation for combining acetylcysteine with other drugs. The table is not presented as positive assurance that no incompatibility will be present, since these data are based only on short-term compatibility studies done in the Mead Johnson Research Center. Manufacturers may change their formulations, and this could alter compatibilities. These data are intended to serve only as a guide for predicting compounding problems. If it is deemed advisable to prepare an admixture, it should be administered as soon as possible after preparation. Do not store unused mixtures. The rating, Incompatible, is based on the formulation of a precipitate, a change in clarity, immiscibility or a rapid loss of potency of acetylcysteine or the active ingredient of the PRODUCT AND/OR AGENT in the admixture. The rating, Compatible, means that there was no significant physical change in the admixture when compared with a control solution of the PRODUCT AND/OR AGENT, and that there was no predicted chemical incompatibility. All of the admixtures have been tested for short-term chemical compatibility by assaying for the concentration of acetylcysteine after mixing. The active ingredient in the PRODUCT AND/OR AGENT was also assayed after mixing. Some of the admixtures developed minor physical changes which were considered to be insufficient to rate the admixtures incompatible. These are listed in footnotes 3, 4, and 5. A strong odor developed after storage for 24 hours at room temperature. The admixture was a slightly darker shade of yellow than a control solution of the PRODUCT AND/OR AGENT. A light tan color developed after storage for 24 hours at room temperature. Entries are final concentrations. Values in parentheses relate volumes of acetylcysteine solutions to volume of test solutions. (Antidotal) Acetaminophen is rapidly absorbed from the upper gastrointestinal tract with peak plasma levels occurring between 30 and 60 minutes after therapeutic doses and usually within 4 hours following an overdose. The parent compound, which is nontoxic, is extensively metabolized in the liver to form principally the sulfate and glucuronide conjugates which are also nontoxic and are rapidly excreted in the urine. A small fraction of an ingested dose is metabolized in the liver by the cytochrome P-450 mixed function oxidase enzyme system to form a reactive, potentially toxic, intermediate metabolite which preferentially conjugates with hepatic glutathione to form the nontoxic cysteine and mercapturic acid derivatives which are then excreted by the kidney. Therapeutic doses of acetaminophen do not saturate the glucuronide and sulfate conjugation pathways and do not result in the formation of sufficient reactive metabolite to deplete glutathione stores. However, following ingestion of a large overdose (150 mg/kg or greater) the glucuronide and sulfate conjugation pathways are saturated resulting in a larger fraction of the drug being metabolized via the P-450 pathway. The increased formation of reactive metabolite may deplete the hepatic stores of glutathione with subsequent binding of the metabolite to protein molecules within the hepatocyte resulting in cellular necrosis. Acetylcysteine has been shown to reduce the extent of liver injury following acetaminophen overdose. Its effectiveness depends on early oral administration, with benefit seen principally in patients treated within 16 hours of the overdose. Acetylcysteine probably protects the liver by maintaining or restoring the glutathione levels, or by acting as an alternate substrate for conjugation with, and thus detoxification of, the reactive metabolite. Acetylcysteine Solution, USP administered orally, is indicated as an antidote to prevent or lessen hepatic injury which may occur following the ingestion of a potentially hepatotoxic quantity of acetaminophen. It is essential to initiate treatment as soon as possible after the overdose and, in any case, within 24 hours of ingestion. There are no contraindications to oral administration of acetylcysteine in the treatment of acetaminophen overdose. Generalized urticaria has been observed rarely in patients receiving oral acetylcysteine for acetaminophen overdose. If this occurs or other allergic symptoms appear, treatment with acetylcysteine should be discontinued unless it is deemed essential and the allergic symptoms can be otherwise controlled. If encephalopathy due to hepatic failure becomes evident, acetylcysteine treatment should be discontinued to avoid further administration of nitrogenous substances. There are no data indicating that acetylcysteine influences hepatic failure, but this remains a theoretical possibility. Occasionally severe and persistent vomiting occurs as a symptom of acute acetaminophen overdose. Treatment with oral acetylcysteine may aggravate the vomiting. Patients at risk of gastric hemorrhage (eg, esophageal varices, peptic ulcers, etc.) should be evaluated concerning the risk of upper gastrointestinal hemorrhage versus the risk of developing hepatic toxicity, and treatment with acetylcysteine given accordingly. Dilution of the acetylcysteine (see Preparation of Acetylcysteine for Oral Administration) minimizes the propensity of oral acetylcysteine to aggravate vomiting. Oral administration of acetylcysteine, especially in the large doses needed to treat acetaminophen overdose, may result in nausea, vomiting and other gastrointestinal symptoms. Rash with or without mild fever has been observed rarely. The stomach should be emptied promptly by lavage or by inducing emesis with syrup of ipecac. Syrup of ipecac should be given in a dose of 15 mL for children up to age 12 and 30 mL for adolescents and adults followed immediately by drinking copious amounts of water. The dose should be repeated if emesis does not occur in 20 minutes. In the case of a mixed drug overdose activated charcoal may be indicated. However, if activated charcoal has been administered, lavage before administering acetylcysteine treatment. Activated charcoal adsorbs acetylcysteine in vitro and may do so in patients and thereby may reduce its effectiveness. Draw blood for predetoxification acetaminophen plasma assay and baseline SGOT, SGPT, bilirubin, prothrombin time, creatinine, BUN, blood sugar and electrolytes. Administer the loading dose of acetylcysteine, 140 mg per kg of body weight. (Prepare acetylcysteine for oral administration as described in the Dosage Guide and Preparation table). Determine subsequent action based on predetoxification plasma acetaminophen information. Choose ONE of the following four courses of therapy. Administer a first maintenance dose (70 mg/kg acetylcysteine) 4 hours after the loading dose. The maintenance dose is then repeated at 4-hour intervals for a total of 17 doses. Monitor hepatic and renal function and electrolytes throughout the detoxification process. B. Predetoxification acetaminophen level could not be obtained: Proceed as in A.
C. Predetoxification acetaminophen level is clearly in the non-toxic range (beneath the dashed line on the nomogram) and you know that acetaminophen overdose occurred at least 4 hours before the predetoxification acetaminophen plasma assays: Discontinue administration of acetylcysteine. 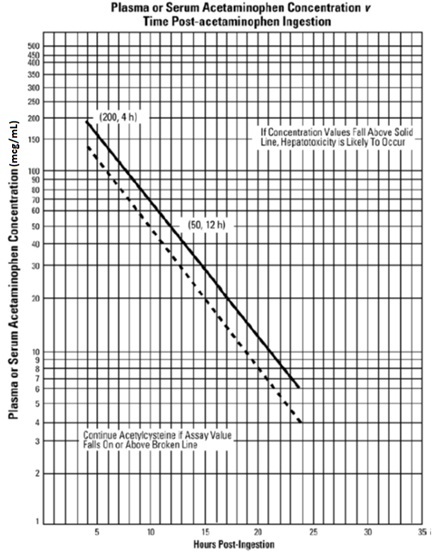 D. Predetoxification acetaminophen level was in the non-toxic range, but time of ingestion was unknown or less than 4 hours. Because the level of acetaminophen at the time of predetoxification assay may not be a peak value (peak may not be achieved before 4 hours post-ingestion), obtain a second plasma level in order to decide whether or not the full 17-dose detoxification treatment is necessary. If the patient vomits an oral dose within 1 hour of administration, repeat that dose. In the occasional instances where the patient is persistently unable to retain the orally administered acetylcysteine, the antidote may be administered by duodenal intubation. Repeat SGOT, SGPT, bilirubin, prothrombin time, creatinine, BUN, blood sugar and electrolytes daily if the acetaminophen plasma level is in the potentially toxic range as discussed below. Oral administration requires dilution of the 20% solution with diet cola or other diet soft drinks, to a final concentration of 5% (see Dosage Guide and Preparation table). If administered via gastric tube or Miller-Abbott tube, water may be used as the diluent. The dilutions should be freshly prepared and utilized within one hour. Remaining undiluted solutions in opened vials can be stored in the refrigerator up to 96 hours. ACETYLCYSTEINE IS NOT APPROVED FOR PARENTERAL INJECTION. The acute ingestion of acetaminophen in quantities of 150 mg/kg or greater may result in hepatic toxicity. However, the reported history of the quantity of a drug ingested as an overdose is often inaccurate and is not a reliable guide to therapy of the overdose. THEREFORE, PLASMA OR SERUM ACETAMINOPHEN CONCENTRATIONS, DETERMINED AS EARLY AS POSSIBLE, BUT NO SOONER THAN 4 HOURS FOLLOWING AN ACUTE OVERDOSE, ARE ESSENTIAL IN ASSESSING THE POTENTIAL RISK OF HEPATOTOXICITY. IF AN ASSAY FOR ACETAMINOPHEN CANNOT BE OBTAINED, IT IS NECESSARY TO ASSUME THAT THE OVERDOSE IS POTENTIALLY TOXIC. If the predetoxification plasma level is above the broken line continue with maintenance doses of acetylcysteine. It is better to err on the safe side and thus the broken line is placed 25% below the solid line which defines possible toxicity. If the predetoxification plasma level is below the broken line described above, there is minimal risk of hepatic toxicity and acetylcysteine treatment can be discontinued. 1. Blair D, Rumack, BH, Clin Chem, 1977 ; 23(4):743âˆ’745. 4. Glynn JP. Kendal SE, Lancet 1975; 1(May 17):1147-1148. Maintain fluid and electrolyte balance based on clinical evaluation of state of hydration and serum electrolytes. Treat as necessary for hypoglycemia. Administer vitamin K1 if prothrombin time ratio exceeds 1.5 or fresh frozen plasma if the prothrombin time ratio exceeds 3.0. Diuretics and forced diuresis should be avoided. **If patient weighs less than 20 kg (usually patients younger than 6 years), calculate the doses of Acetylcysteine. Each mL of 20% Acetylcysteine contains 200 mg of acetylcysteine. The loading dose is 140 mg per kilogram of body weight. The maintenance dose is 70 mg/kg. Three (3) mL of diluent are added to each mL of 20% Acetylcysteine Solution. Do not decrease the proportion of diluent. The following nomogram has been developed to estimate the probability that plasma levels in relation to intervals post ingestion will result in hepatotoxicity. Adapted from Rumack and Matthews, Pediatrics 1975; 55:871âˆ’876. Acetylcysteine Solution, USP is available in rubber stoppered glass vials containing 4, 10, or 30 mL. The 20% solution may be diluted to a lesser concentration with either Sodium Chloride for Injection, Sodium Chloride for Inhalation, Sterile Water for Injection, or Sterile Water for Inhalation. The 10% solution may be used undiluted. Acetylcysteine 10% solution (100 mg acetylcysteine per mL). Sterile, not for injection. Acetylcysteine 20% solution (200 mg acetylcysteine per mL). Sterile, not for injection. Store at 20°-25°C (68°-77°F); excursions permitted to 15°-30°C (59°-86°F) (see USP Controlled Room Temperature). Store in refrigerator 2° - 8°C (36° - 46°F) after opening. Acetylcysteine does not contain an antimicrobial agent, and care must be taken to minimize contamination of the sterile solution. Dilutions of acetylcysteine should be used freshly prepared and utilized within one hour. If only a portion of the solution in a vial is used, store the remaining undiluted portion in a refrigerator and use within 96 hours. Bonanomi L, Gazzaniga A. Toxicological, pharmacokinetic and metabolic studies on acetylcysteine. Eur J Respir Dis, 1981; 61 (Suppl III): 45-51. Am Rev Respir Dis, 1960; 82:627âˆ’639.